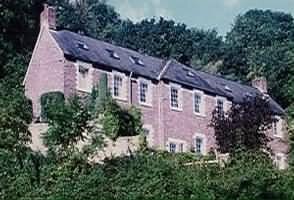 Crickhowell accommodation in friendly Crickhowell hotels, B&B, Bed and Breakfast, homely Guest Houses, cosy Holiday Cottages, congenial Country Pubs and Inns, luxurious Crickhowell Country House Hotels and Caravan and Camping sites. Situated in the beautiful Usk valley within the Brecon Beacons National Park and close to the pretty market town of Crickhowell, we are superbly located for lots of outdoor activities. With 22 individual styled bedrooms, The Manors interior is honest and unpretentious. Our Bistro overlooks the valley encroached by an impressive escarpment and below the river Usk. Our food is quintessentially British, we believe in simple, unfussy food, using seasonal produce. 90% of the meat and poultry served at our restaurant comes from our family farm just down the road. So we know exactly what our animals have been fed throughout their life, and hope this will also lessen our carbon impact on the environment. it provides ideal, affordable accommodation to recharge and refresh in a clean, green, natural environment. in the Brecon beacons national park. 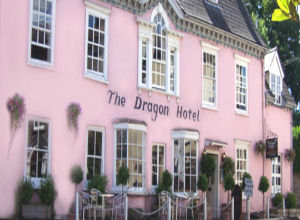 Dragon Hotel Brecon Beacons is a small hotel, with just fifteen bedrooms, and ensures a high level of service, whether you are here on business, on holiday or on a walking or activity breaks. 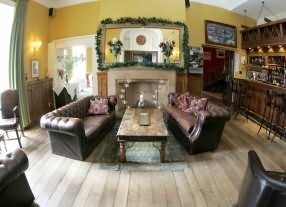 At present they have 2 single and 13 double individually decorated en-suite rooms in our family-run 17th Century hotel. For special occasions we can arrange flowers and champagne in the room. Every year we welcome back many guests who keep returning to enjoy our hotel, our walks and the wonderful brecon beacons national park. Here you can enjoy the best the countryside can offer, a superbly relaxing atmosphere, delicious meals and great hospitality. We look forward to welcoming you. Travellers look forward to stopping off at the Bear, a hotel famous far and wide for its welcoming atmosphere, historic character, convivial surroundings and good food. A cobbled forecourt, archway into the inner courtyard and 19th-century stagecoach timetable in the bar are all reminders of the Bear's former role. Traditions live on, for travellers still look forward to stopping off at the Bear. The Bear's low-beamed bar, filled with antiques and warmed by a roaring log fire in winter, has twice won the ‘Best Pub in Britain' award. It sets the style for a place to stay which is warm and characterful rather than a hotel in the grand manner. You'll be looked after by friendly hosts Judith and Steve Hindmarsh, who are also proud of the Bear's reputation for serving interesting, freshly cooked food (which has won recognition in Britain and the USA). Standard - Situated in the old part of the hotel. Adequate for an overnight stay or a short break. ensuite shower. Double Occupancy £80, Single £65. Superior - Situated throughout the Hotel, larger, more spacious rooms than standards. Ensuite bath and / or shower. Double Occupancy £90, Single £75. Deluxe - Situated mainly in our courtyard area, Ensuite bath & shower. 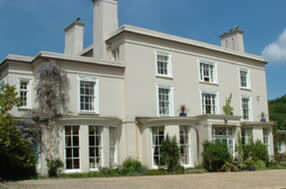 Limited disabled access to ground floor rooms.Double Occupancy £100, Single £85. Jacuzzi - Similar in size to deluxe bedrooms, feature a higher standard of furnishing & decoration. The inclusion of whirlpool baths enhance the standard. Double Occupancy £130, Single £100. Executive - Luxurious bedrooms, with a very high standard of appointments, choice fabrics & decorations used. All these rooms feature armchairs, desks & double whirlpool baths with separate showers. Double Occupancy £150, Single £115. All bedrooms feature remote controlled colour television, direct dial telephone with modem access, hairdryer, tea / coffee making facilities, etc..
and you can be sure of a warm and friendly welcome from Linda Jarrett and Pavel Vitek and their staff. All of our guest bedrooms are en-suite with television, telephone, radio and tea/coffee making facilities. Ty Croeso is ideally situated for touring and exploring the castles, museums and the fascinating old industrial sites of South and Mid Wales. Leisure activities within a 10-mile radius include walking, horse riding, hang-gliding, angling, sailing, golf, canal boating and caving. We have received the Green Dragon Environmental Standard Award in recognition of our efforts to help the environment by recycling, saving energy and reducing waste. Sorry, we do not accept pets, but guide dogs are welcome. Please note that we are a no-smoking hotel. Our restaurant is open to non-residents every day from 7p.m. From April to September we are open for light lunches & afternoon tea. Reservations are recommended for dinner. Glangrwyney Court is a privately owned Grade ll Listed House set in magnificent gardens within the Brecon Beacons National Park. Easily accessible off the A40 , three miles from the market town of Abergavenny and two miles from the thriving little town of Crickhowell. Our location provides excellent transport links from London and Cardiff and is the perfect base for exploring the Brecon Beacons, Black Mountains and the Wye Valley. Our Rooms – Each room has been individually decorated and offers either ensuite or private bathroom facilities. All rooms have t.v. and teamaking, robes as well as fluffy towels , exclusive toiletries , hair dryers , clock radios and some rooms have d.v.d s..We have a small library of d.v.ds including a choice for children . All our rooms have views over the gardens and parkland . There is a luxury suite in the Garden Courtyard which has a galleried double bedroom , ensuite bathroom with bath and shower and also a beautiful sitting room and large full kitchen. It is possible for this to be self catering if requested. In addition there is one double room which is in the Garden Courtyard and which is suitable for those who cannot manage a room on the first floor. Overlooking the river Usk, Park Place offers stunning views of the Black Mountains and the Brecon Beacons. Situated close to Crickhowell bridge on the A4077 Gilwern road, a short distance from the A40, Park Place is conveniently located for those wishing to take part in a multitude of activities including walking, fishing, orienteering, hang-gliding, canoeing, bicycling, trail biking or just relaxing away from it all! We have six bedrooms available. We look forward to making you welcome and comfortable during your stay with us, whether for one night or a week we are renowned for our hospitality. 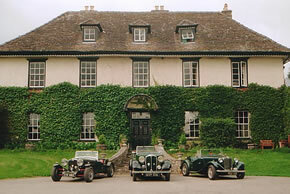 Built around 1690, Llangattock Court has historic associations with both Nelson and Marconi. Llangattock Court has always been a family home. Now that our children are grown up we are delighted to welcome others into our home and hope you will enjoy the family atmosphere. The bedrooms are spacious, but at the same time cosy. There is no better way to start the day than with an Aga cooked breakfast. Then take a stoll round the pleasant grounds before setting out for the day. If you enjoy walking, country pursuits, visiting castles and historic sites, painting or photography, or simply relaxing in beautiful surroundings, then Spoil Yourself! Llangattock Court in the Usk Valley and within the Brecon Beacons National Park, is the ideal base for you. The area with its mountains, rivers, lakes and magical secret places has a special beauty which equals that of any part of Britain. The Firs is a charming country house situated in a secluded position on the edge of the village of Tretower. You will receive a very warm welcome when you arrive and will immediately experience a relaxed atmosphere. The house is approximately 200 years old and the character of the age has been maintained with central heating being the only added modern extra. The rooms are well-appointed with the comfort of those that visit being the first consideration. Opposite the property is the medieval Tretower Court and Castle where visitors will see two historic sites dating back to the 11th and 12th centuries. Tretower is within walking distance of the Black Mountains where you can spend your days exploring. For those who like doing something different, one of the best gliding clubs in the country is based nearby; if you like sailing - Llangorse Lake is within easy driving distance. Another pleasure is driving around the Brecon Beacons National Park, visiting the various waterfalls, or climbing the Brecon Beacons. mountain biking is also a popular activity with ideal terrain situated all around. 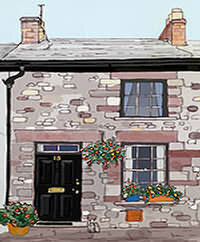 The village is also conveniently located for Hay-on-wye and its book & antique shops and traditional tea rooms. 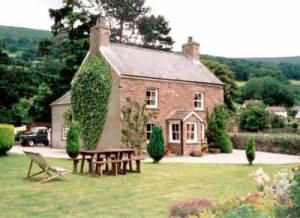 For directions to The Firs Guest House leave the A40 for the A479, 2 miles west of Crickhowell. The A479 takes you into the village of Tretower. Crickhowell is in the beautiful valley of the River Usk set in the Black Mountains. It is ideally situated between Brecon and Abergavenny, two renowned market towns. There is plenty to do in the area ranging from pony trekking, fishing for salmon and trout, to adventure hoildays i.e paragliding, hand gliding, yachting at Llangorse lake or hill walking. Greenhill Villas is situated on the main A40 in Crickhowell opposite the Health Centre which is 3 minutes walk from the Town Centre.Take a look at Crickhowell bridge it has 12 arches on the one side and thirteen on the other side. All rooms have tea and coffee hand basins and large bath towels. You are provided with a key to your room and front door so you dont have to worry what time you come in. we will most certainly be visiting again"
Enjoy the experience of Porthmawr: wander through the gardens, enter the 15th Century Gate House, sit on the terrace with a glass of wine while watching the sun set and moreover relax and have a wonderful time. Complimentary coffee,tea and nibbles are served on arrival on the veranda in the summer or infront of an open roaring fire during the winter nights. Porthmawr Country House offers the perfect setting for your wedding day, please do not hesitate to contact us for our personal un-divided attention. We have facility to accommodate for families/children. There is ample parking available on site and secure lock-ups for motorbikes, bicycles, hangliders etc. Crickhowell a picturesque town in the Brecon Beacons National Park, to the south of the Black Mountains and in the valley of the river Usk. Crickhowell makes the perfect base to take advantage of the numerous activities in the area. The region is a haven for walkers and cyclists and is within striking distance of a wealth of industrial history. The town is well-known for the high standard of its eating and drinking establishments. 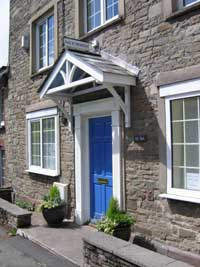 Ty Tal B&B is situated just three minutes walk from the High Street. It is a Victorian house which has been extensively refurbished and now provides very comfortable accommodation. Our ethos is to create a ‘home from home’ atmosphere. We have private off-road parking and a lock-up for cycles. Breakfasts are served using high quality homemade and local produce. It has gone through a number of evolutions during its c.400 year history. Large beamed room with sloping ceilings ~ Accessed by steep circular stone staircase ~ Double bed ~ Ensuite bathroom ~ Double doors leading onto internal balcony. Double bed ~ Beamed ceiling ~ Large inglenook fireplace (not useable). High beamed ceiling ~ Beautiful stone fireplace (not useable) ~ Dining table, TV, music centre, soffa and armchairs. a stainless steel sink, work surface, fridge with freezer compartment, four ring electric cooker with grill and full size oven, kettle and toaster, microwave, full set of pans, cooking utensils, table ware for 6. We regret we are unable to accommodate children under 12 years, pets or smokers. Grade II listed, the cottage nestles in the oldest street in Crickhowell, and is only 2 minutes walk from the River Usk, famous for its excellent fishing and wildlife. Ramblers Rest cottage is looked after and maintained by the owners, to ensure you have everything you need for a perfect break. 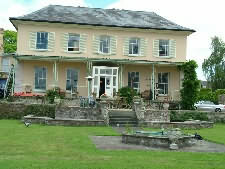 Paddock, Vine Tree and Usk cottages may be linked to provide accommodation for a larger family. The Neuadd is made up of eight separate cottages and apartments, set around an attractive cobbled courtyard; each representing the highest standards of comfort and luxury, whilst retaining an abundance of original features such as exposed stone walls, oak beams and original windows. All the cottages are tastefully and individually furnished - the ground floor cottages having wooden floors and rugs. All have comfortable sofas and chairs with co-ordinating fabrics, cushions and curtains, along with individual pieces of stripped antique pine furniture, and of course t.v. and video. All cottages are open plan and the kitchens have solid oak tables and chairs and kitchen units, belfast sink and antique taps, plate racks and dressers. They are fully equipped with electric cooker, fridge freezer, microwave - ample work and storage space with all the necessary crockery, pans, glassware and utensils. Crisp Egyptian cotton bed linen, high quality duvets and covers, anf fluffy towels all are provided for your comfort, together with teatowels, toilet ad kitchen rolls and all cleaning materials. There is a shared laundry / drying room. Barbecues, travel cot and high chair also available. Dogs are very welcome (by arrangement please) at an extra charge. The top spot for outdoor activities, educational field studies and training courses. 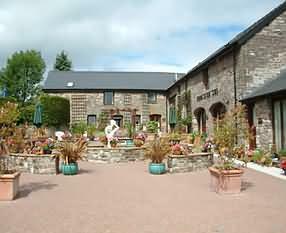 Perth-y-Pia is located in the heart of the Black Mountains National park. The unique combination of mountains, rivers, caves, and industrial heritage makes the area superb for a wide variety of users. Our guests include families, scouts, ramblers, canoeists, cyclists, cavers, training groups, educational groups, families, hen & stag parties and social groups. Perth-y-Pia is a stone built fifteenth century farmhouse. The accommodation is in two recently converted units. 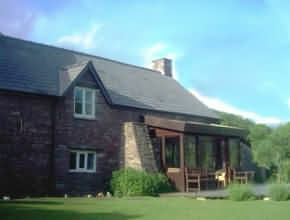 The Farmhouse sleeps up to sixteen people in five bedrooms and the Barn sleeps up to sixteen people in four bedrooms. The farmhouse comprises a comfortable living room complete with original hearth and old bread oven, a fully equipped kitchen/dining room, five bedrooms and three new showers and toilet rooms. In total sixteen people can be accommodated in a mixture of bunkbeds and single beds. There is central heating throughout. The Barn provides a higher standard of accommodation with four bedrooms all having en-suite toilet and shower facilities, sleeping up to sixteen people in a mixture of bunk beds and single beds. There is also a well equipped kitchen and a spacious living and dining area, a drying room, a small garden and full central heating. 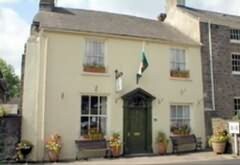 The Farmers Arms is a traditional Welsh country inn, recommended in all the major independent guides. 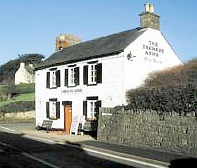 The Farmers Arms serve good Welsh real ales plus guest ales and offer fine, inexpensive wines and expertly cooked food, which is supplied from a wealth of first class local producers. That is not all! 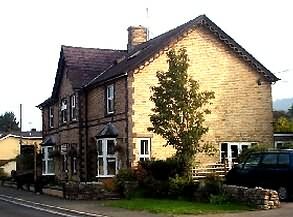 We have an excellently situated beer garden, good parking and comfortable, bed & breakfast accommodation. We have two en-suite rooms, each with tea/coffee making facilities and TV. The Green Room is a large and airy room; simply furnished yet a comfortable family room, double or twin.For those who want a more intimate room, the Pink room is a double room, attractively furnished. We are also well situated for all who enjoy fishing, pony trekking, walking etc. So if you appreciate the countryside, enjoy good food and a relaxed, friendly atmosphere with 'normal' people, contact us now!